Walking is an essentially human activity. From a basic means of transport and opportunity for leisure through to being a religious act, walking has served as a significant philosophical, literary and historical subject. Thoreau’s 1851 lecture on Walking or the Romantic walks of the Wordsworths at Grasmere in the early 19th Century, for example, helped create a philosophical foundation for the importance of the act of walking as an act of engagement with nature. Similarly, and sometimes inseparable from secular appreciation, pilgrimage trails provide opportunities for finding self and others in the travails of the walk. More recently, walking has been embraced as a means of encouraging greater health and well-being, community improvement and more sustainable means of travel. Yet despite the significance of the subject of walking there is as yet no integrated treatment of the subject in the social science literature. This handbook therefore brings together a number of the main themes on the study of walking from different disciplines and literatures into a single volume that can be accessed from across the social sciences. It is divided into five main sections: culture, society and historical context; social practices, perceptions and behaviours; hiking trails and pilgrimage routes; health, well-being and psychology; and method, planning and design. Each of these highlights current approaches and major themes in research on walking in a range of different environments. 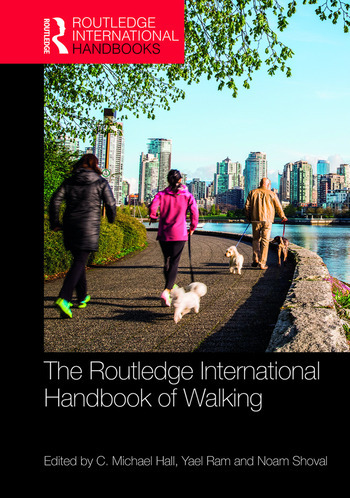 This handbook carves out a unique niche in the study of walking. The international and cross-disciplinary nature of the contributions of the book are expected to be of interest to numerous academic fields in the social and health sciences, as well as to urban and regional planners and those in charge of the management of outdoor recreation and tourism globally. C. Michael Hall is Professor of Marketing, University of Canterbury, New Zealand; Docent in Geography, Oulu University; Visiting Professor, Linneaus University; and Senior Research Fellow, University of Johannesburg. Author and editor of over 80 books, he has published widely on tourism, sustainability, governance and food issues. Yael Ram is Senior Lecturer at the Department of Tourism Studies, Ashkelon Academic College, Israel. Noam Shoval is Professor of Geography at the Hebrew University of Jerusalem, Israel.